These days internet access is more and more important. Think of navigating on the go, checking timetables, finding a good restaurant locally or sharing your experiences with family and friends – just to name a few options. Visitors asked us: “Is it worth getting a Pocket Wi-Fi and how good is it?”. We decided to rent a unit ourselves in order to find out. Picking up the Wi-Fi was easy. We went to the airport Wi-Fi counter (in this case at Kansai Airport), showed our Wi-Fi reservation number and passport, we then quickly received our Wi-Fi Package. The package contains the Wi-Fi router, charging cord both for USB and AC, instruction manual and return form for customers who wish to return the router by registered mail. The router comes with unlimited data but the speed is limited after a daily cap of 3 GB which resets during the night. The router works out of the box. There is a network name (SSID) and password written on the router. Click on the network name in the Wifi network list of your device, enter the password and you are good to go. The connection is made via the Softbank LTE network and coverage is quite comprehensive. We used the Wi-Fi throughout our trip from the busy metropolis of Tokyo to the remote areas of Kyushu and coverage was good to excellent everywhere. Speeds do differ, urban areas it’s fast and definitely better than your average hotel Wi-Fi, in more rural areas the speed is lower but it’s still fine to stream content like Netflix and YouTube. Battery performance is good and will get you through 1-2 days depending on usage but is quickly recharged overnight. The Wi-Fi is great on the train as well, keep the kids busy so you have time to enjoy the landscape pass by or just a moment for yourself. In tunnels, however, the connection does drop from time to time. High-speed internet on the high-speed bullet train. We returned the router to the airport counter, just a quick check if all the contents were there and that’s it. The package can also be returned by registered mail. 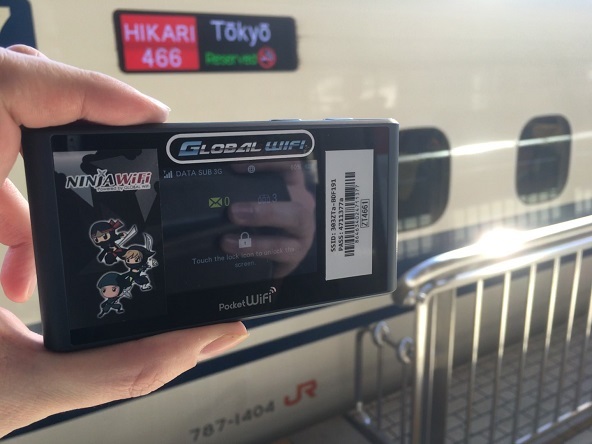 In the past, it used to be difficult to find any open hotspot in Japan. This is getting better with convenience stores offering Wi-Fi and coffee shops and stations that have public hotspots available. However, these are often in Japanese only and sometimes require sign-up beforehand. There is also no Wi-Fi available on public transport. In short, public Wi-Fi is definitely not as available and accessible as it is in the US or other countries.